Announcement Lots of Fun & Funky Outfits, sewn by myself with the help of my Design Team-Carina 11 & Gabriella 8. Also enjoy the challege of custom orders!! You can also "Like" Sweet Pea Kidz on Facebook for the latest designs and FB only Coupon Codes. I am now located in 2 retail stores and make deliveries weekly. Lots of Fun & Funky Outfits, sewn by myself with the help of my Design Team-Carina 11 & Gabriella 8. Also enjoy the challege of custom orders!! 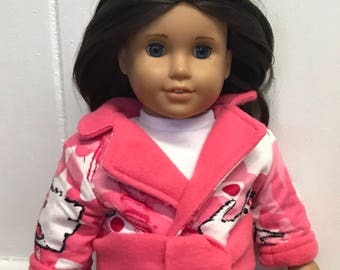 18 inch Girl Doll Puppy Pink Flannel bathrobe, American Doll Dog bathrobe, 18 inch doll bathrobe made and Ready to Ship TODAY! Very cute sparkly shoes! Thank you! 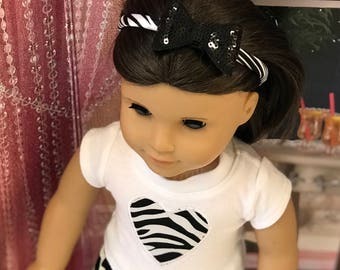 Just added to our doll clothing line!! Shoes! Another beautiful Paris inspired outfit. Quantities limited. Just listed and only 3 available!!! Wonderful business to have enjoying time with my girls. Below find everything you need to know to have a successful transaction. Have questions? Please convo me! Because I am a small shop with large volumes I regret that I cannot accept returns. However, I do want you to be happy. Should you have an issue with your purchase please contact me and I will do my best to work with you. We like our customers and want to do our best to make you happy! I accept Paypal (Mastercard, VISA, Diners, Amex, etc.) and most major credit cards via etsy's direct checkout system. I also accept etsy gift cards. - Ready-to-Ship: Once I receive payment, most ready-to-ship items go out the next business day via First Class Mail with Delivery confirmation. Orders received Saturday and Sunday will ship on the following Monday. You may upgrade to Priority for an additional fee. Insurance: Please contact me if you would like insurance prior to payment. If you would like to purchase insurance, please let me know, I will get you a quote and check on availability for you. Shipping times vary from country to country and during certain times of year. The recipient is responsible for any customs duties or taxes upon arrival. Please contact me if you don't see your country listed for shipping. Priority mail upgrade is available for an additional fee. Please add the "Priority Mail" listing to your cart at check out. 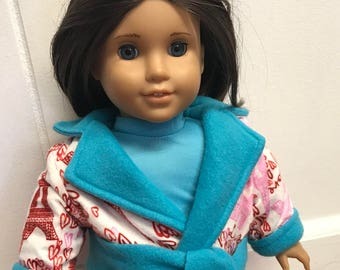 My doll clothes will fit 18 inch dolls & 15 inch dolls. Each listing will state doll size. 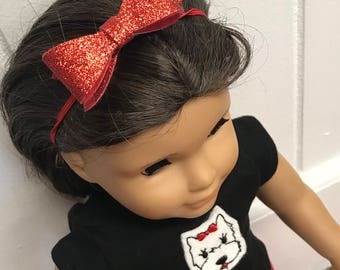 The following is a list of dolls and sizes. 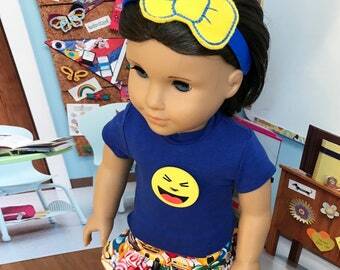 18 inch-Will fit American Girl Doll, Our Generation (Target), Madame Alexander, Journey Girls (Toys R Us). 15 inch-Will fit American Girl Twin Dolls, Bitty Baby, Corelle, Gotz.